Giveaway items, also called “swag,” remains one of the most impactful marketing practices a company can use. Give a potential a branded item they are about 85% likely to remember your company. Despite the marketing world’s focus on digital marketing to grow your business, giveaway items have only become more effective. The customer still wants to hold something in their hands. However, careful thought should be taken before any marketing professional orders a thousand plushies for their company. Your company can also lose a great deal of money by giving things away. The following best practices will see to it that your giveaway items create the desired effect and boost your company. It’s important to tailor the items to fit the audience and situation. Study the audience you’re going to give the items to and pick something they’ll like. Also consider where you’ll be handing out the items. An ideal item for industry insiders at a trade show will not be the same item you hand out to potential customers at a local event. Also consider the product you wish to sell. If you’re a computer company for instance, you shouldn’t be handing out notebooks. The more thought you can put in at this stage, the more likely your item is to wow the target audience. When picking a giveaway item, remember to pick something practical. While t-shirts, plushies, and stress balls are popular giveaway items; they will always be trumped by pens, water bottles, and USB chargers. If your item is practical the receiver is more likely to keep it. This is where the brand builds, since using the item everyday reinforces the brand name. The best example of this is pens with a nice business logo design on them. These are cheap to acquire in bulk and can be easily given out. While these items might seem less exciting as other options, they’ll continue to market your company for years. The most effective way to pass out giveaway items, is to call people to action. Here you offer the giveaway item in exchange for some easily accomplished social media marketing. If you give out an unusual hat, get the receiver to take a selfie with it. More elaborate challenges can help make the whole marketing exercise feel like a game, with the giveaway item as the prize. Of course, there’s only so far you can push depending on the situation your in. However, this sort of call to action not only gets your company social media marketing, it reinforces the brand to the recipient with positive memories. 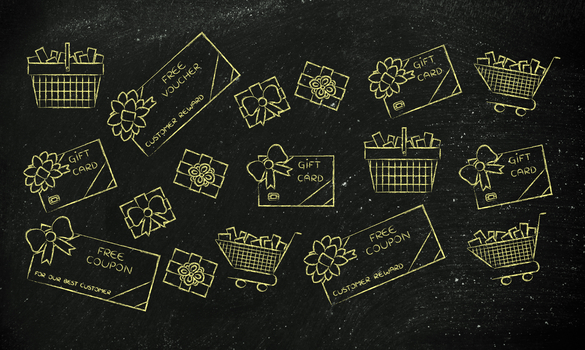 Sharing giveaway items can turn recipients into brand ambassadors. If the recipient seems receptive to your company, invite them to take an extra item for a friend. While this might not feasible depending on the situation, it should be encouraged. Once you give them out, you never know where giveaway items might end up. Over the course of time, many people might see them and be left with a favorable impression of your brand. While the brand name and logo on the item should be left simple, always make sure there’s a way to connect the item back to you. Today, connecting customer analysis is easier then ever. Putting a hashtag related to the company into the design will allow recipients to connect with you. An even more advanced option is to use a QR code. This is a code that, when scanned by a cell phone, connects them to a site or app of your choice. Even a custom web address to take them to a promotional page would work well. In short, make it easy for the recipient to come back and learn more about your company. Giveaway Items might seem contradictory to some. Why would any company give anything away for free? However, this is probably the most effective form of marketing if you do it right. By picking the items to give away right, making use of social media, and engaging the recipient your company can spread fast. These items encourage word of mouth, and help remind potential customers years later. If you give away the right things, at the right time, to the right people, you can jump start your marketing campaign.